Desirable Willow Creek presents a gorgeous turn-key two-story. This popular Waterbury model boasts a spacious interior with gleaming hardwoods, new carpet, newer windows, updated kitchen, and two remodeled baths! Primed for entertaining & relaxing, this floorplan offers formal living & dining + a family room off the kitchen with a vaulted exposed beam ceiling, cozy gas fireplace, and access to the backyard. Kitchen features include granite counters, stainless appliances, ample cabinetry with a breakfast bar, and adjoining eating nook. A half bath & laundry complete this level. Upstairs, 4 bedrooms & 2 baths include a master with custom walk-in closet & a private 3/4 bath. The basement affords an additional family room or rec room with rough-in plumbing awaiting your finishing touch. Outside, enjoy a newly painted deck and patio surrounded by mature landscaping maintained by a sprinkler system. 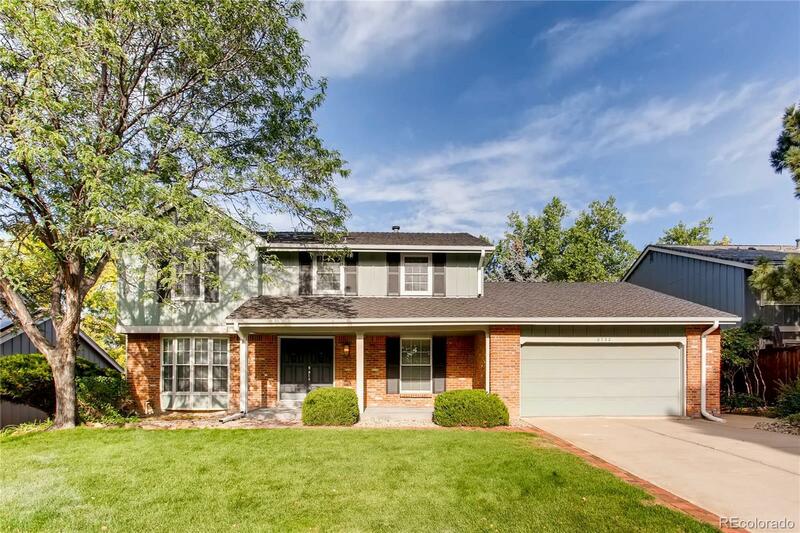 Great location within close proximity to Cherry Creek schools, Park Meadows, and light rail.